I am going to tell you a story now. A man fell in love with a woman. She fell in love back. They married, information pills and to celebrate their marriage, salve they journeyed to Beijing. They toured the city, mesmerized. They ate rich and pungent food. They heard lush choral music sung by brightly-dressed acrobats in vivid masks. They bought things. This was 14 years ago. The man loved heavy metal tools. He bought two cleavers on the street. The boys who sold him the thick stainless steel one smiled and laughed and asked for three dollars’ worth of yuan. The man thought it a fair price for a solid stainless steel cleaver. He adored this tool so much he forgot where he had bought the other one, the wood-handled one, earlier that day. He took them home and used them. The wood-handled one kept its edge longer, cut more slickly. But he kept them both, and used them daily. Time passed. The man chopped and sliced food with the steel cleaver. He grumbled about the dullness of its blade. About how the steel was too hard to sharpen. He used it often as a spatula, sharpened it until its blade grew notched. And so he forgot about the thing, in its way. It was just that cleaver. The one that didn’t work as well. It took turns with all the other knives, and that was enough. After 14 years, two months and two days, his wife bought a coconut. She asked him to open it, and because he loved her he set to work. He would puncture it first to let her drink the coconut milk. Then he planned to break open the coconut shell so that she could enjoy the nut meat itself. The man first tried punching a hole in the nut with a sharp steak knife. This failed. She suggested the power drill, since that had worked once before. The man agreed. He fetched the power drill and fitted it with the correct diameter bit to sink a pilot hole. He drilled through, and exclaimed at how tough the nutshell was. At last, the whining drill punctured the nutshell in a geyser of coconut milk. The man changed drill bits, and now he drilled a larger hole. Once it was wide enough, he put a straw into the hole, and gave the coconut to his wife. She enjoyed the milk and thanked him. Then she gave it back and asked him to open the nut so that she could eat its center. The man set the coconut on the chopping board. He tried tapping a hole in the nut with the corner of the cleaver, but the angle was wrong and dangerous. He tried two solid chops, but they bit through the fibrous mantle and hit something hard – the shell of the kernel. The man suspected that a combination of force and edge would break it. So he grabbed his hammer. He positioned the edge of the cleaver atop the nut. He hit the top, dull side of the cleaver blade with the hammer. He hit it several times – TCHENK! TCHENK! TCHENK! Nothing happened. The blade sank ever so slightly deeper. Then it stopped. He hit the blade-back dead center twice more with the hammer – good hard blows. The handle snapped off from the back of the blade, along a jagged line. He showed his wife and children the broken cleaver. He explained what had happened. They all laughed and exclaimed over it. Now the man put aside the cleaver and took up the hammer. He aimed its head straight down and swung hard at the coconut. The head punched through the wall of the nut. Shards of coconut meat and shell flew up from the impact. The man’s family shouted excitedly. He levered the hammer out of the coconut and swung again. Again, he buried the head in the nut. The man continued to hammer away at the coconut, turning it sometimes to try a different angle. Flakes of pulverized coconut splattered the countertop and cabinet doors around him. His wife and son and daughter hollered and laughed. The nut would not open far enough to give access to the nut-meat. But the man persisted. He pounded the coconut with the hammer again and again. At last, he pulled at the nearly-severed halves of the nut, and it split, throwing fragments of itself to the floor. The man laughed and handed the nut pieces to his wife. She took a spoon and enjoyed the coconut meat. The man put aside the broken tool and cleaned up the mess. 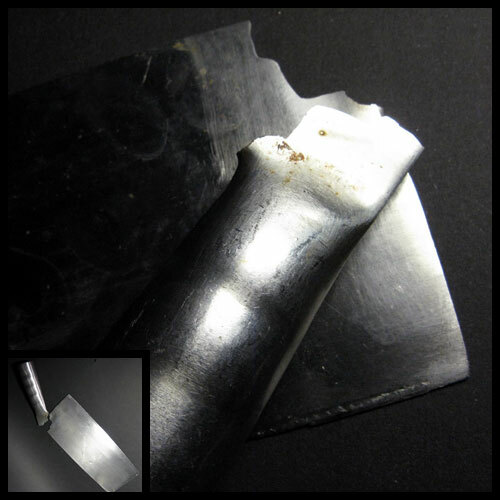 The next night the man took photos of the broken cleaver. He realized, in handling it, that it was likely not worth fixing. He would have to dispose of it – but safely. Tonight, the man finally settled on wrapping the pieces in the padded shipping bag that just arrived from China. He then wrapped the bag in packing tape because he did not want to see anyone at the trash plant hurt themselves with the cleaver. Tonight, he threw it away into the trash. It made a thud in the bottom of the thick black plastic can.